"Gladiator commands the Oscar field with 12 nominations, including nods for Best Picture, Best Director (Ridley Scott), Best Actor (Russell Crowe), Best Supporting Actor (Joaquin Phoenix)." 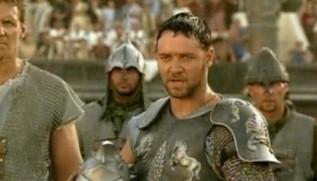 Russell Crowe plays Maximus, a Roman general who leads the troops in conquering Germania for the empire. When an aging Marcus Aurelius (Richard Harris) tells Maximus that he'd like him to rule Rome once he's gone, a classic confrontation ensues between the brave and charming soldier--who wants to return home to his wife, son, and farm--and the jealous and conniving Commodus (Joaquin Phoenix), the emperor's only son, who is thirsty for power. Bought as a slave by the profiteering Proximo (Oliver Reed, in his last role), Maximus must kill or be killed in the ring, battling to save not only himself but the future of the very empire that he loves and honors. CASSIUS [the orator, high in the stands, announces the battle]: On this day we reach back to hallowed antiquity to bring you a recreation of a second Fall of Mighty Carthage. On the barren straits of Zama, there stood the invincible armies of the Barbarian Hannibal. Ferocious mercenaries and warriors from all brute nations bent on merciless destruction conquest. Your Emperor is pleased to give you THE BARBARIAN HORDE! MAXIMUS: You can help me. Whatever comes out of these gates, we've got a better chance of survival if we work together. Do you understand? If we stay together, we survive. [In the Emperor's box.] COMMODUS: My history's a little hazy Cassius, but shouldn't the Barbarians lose the battle of Carthage??!! MAXIMUS: My name is Maximus Decimus Meridius. Commander of the armies of the North, general of the Felix Legions, loyal servant to the true emperor Marcus Aurelius, father to a murdered son, husband to a murdered wife, and I will have my vengeance in this life or the next.